W o k a r e l l a: New Flag? 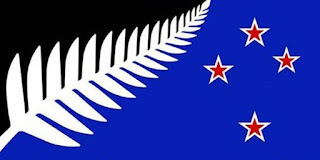 Last month we voted by mail our preference for the our new flag referendum should we change the flag in the future. 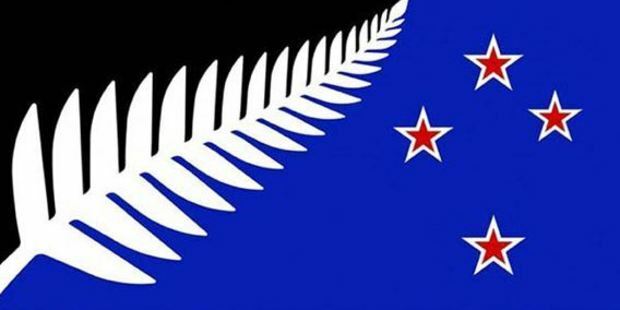 We like Kyle Lockwood's flags but our number one preference is not the above black and blue but red and blue of similar design. The result published in the New Zealand Herald is very interesting. Less than half of eligible voters cast their votes and among those, almost 10% is spoiled votes. They said that it might be the result of protest votes - from people who do not want to change and push for status quo. Some friends of mine either did not vote at all or voted tactically for the least preferable designs. They told me over the coffee that they did not agree with the change so they voted for the design they hated. Didn't they know that they might end up with it? One said that several veterans who fought for the present flag are still alive so we should not change it. Of course they are/were our heroes; more so than rugby stars. I told her I begged to differ about the flag. I believe those who have fought, still with us today or not; they have fought under the flag - not for the flag. They have fought for our democracies and our freedoms so that we can vote today whether to change the flag or not to change and that we can agree to disagree. Whatever they voted for - it's absolutely their freedom of choice and their democratic right to vote. The freedom we sometimes take for granted - the freedom that doesn't come magically by just flying a piece of cloth.